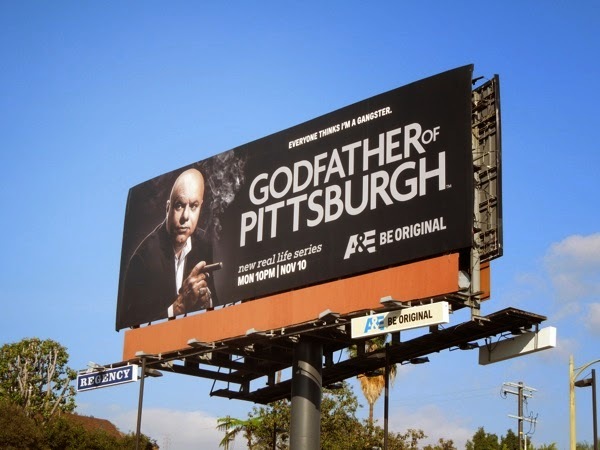 If Vince Isoldi, star of A&E's new reality series Godfather of Pittsburgh, doesn't want everyone to think he's a mafia kingpin, then maybe he shouldn't play the part with the gangster cigar pose and he should rethink the title of the show. This businessman who owns strip clubs and limo services and lives in the Nevillewood in Collier, is the latest reality star to hit TV screens and by now it's fairly obvious that networks are scraping the bottom of the barrel for ideas. Also what is it with the cigar? 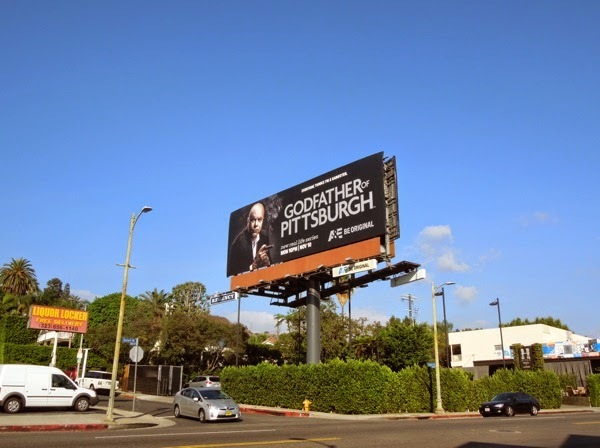 Isn't the advertisement of tobacco products on outdoor billboards banned in California? 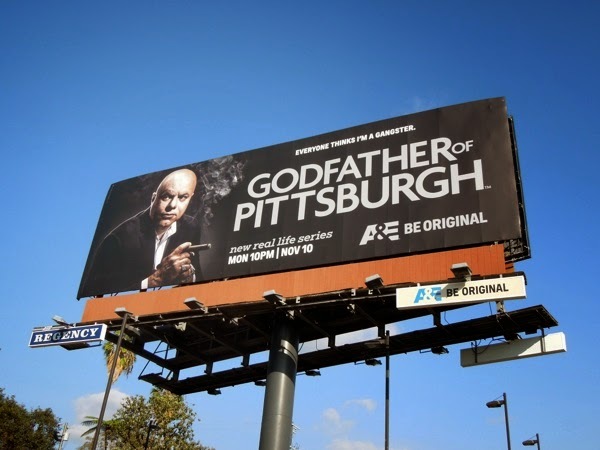 Understandably this billboard is for a TV show trying to evoke a certain type of character, but it still shows someone holding a cigar and perpetuates the practice, just like the recent billboards for Beyoncé and Jay Z's On the Run Tour which showed the rapper smoking a cigar. Hardly a great role model or great imagery for children to see. Even though they are marketed as a luxury, aspirational product and as a sign of success, they are just as harmful as smoking cigarettes, so shouldn't the same laws apply? 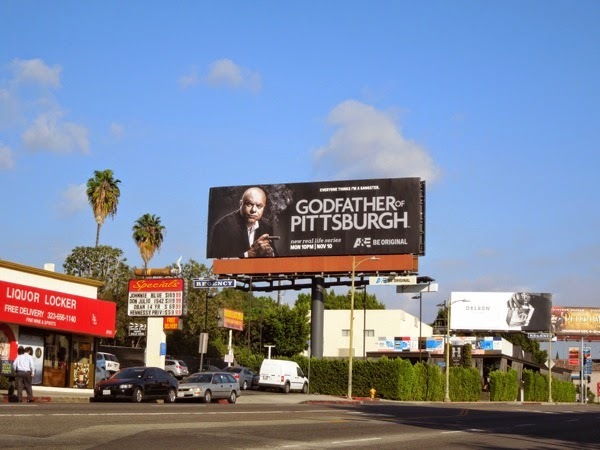 This reality show billboard was snapped along L.A.'s Sunset Boulevard on November 12, 2014 and rather coincidentally there's a cigar sign right in front of this outdoor ad. 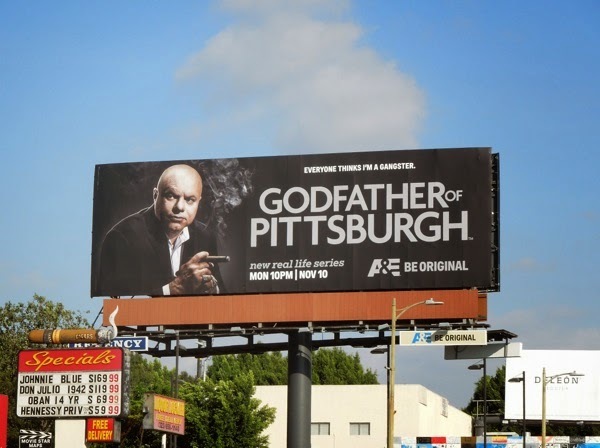 Only time will tell if the Godfather of Pittsburgh will steal the show, or whether his TV stardom aspirations will go up in smoke.